Ocala, FL (February 4, 2017): Week III of the Coachella Desert Circuit kicked off with the $5,000 Johnson Horse Transportation Open Welcome. Riders returned for a chance to start the week off with a win, but only one could walk away a winner. Joie Gatlin of San Juan Capistrano, California, would prove to be the rider to beat in Wednesday’s class riding Rammstein, owned by Jasmine Weber Talley. Only three would advance to the immediate jump-off over a course designed by Olaf Petersen, Jr. of Muenchen, Germany, but the rounds were quick and competitive. The first to turn in a clear first round was Kristin Hardin of New Cayama, California, and Bert. They then powered through the jump-off to stop the clock fault-free in 46.326. and would eventually go home with third place. Next to advance to the abbreviated course was Gatlin and Rammstein. They put down a quick trip in 40.920, where the lead would hold over seven more trips. Joie Gatlin and Rammstein have won this class before during Week II of the National Sunshine Series last year. Jill Henselwood of Oxford Mills, Ontario, was the final rider to garner a jump-off ride aboard Farfelu De Printemps, owned by John Madigan. Chasing Gatlin’s leading time, they zoomed through the course, conquering each fence as they went, but it wasn’t fast enough to take the lead. They passed the timers clear in 42.632 for the ultimate second-place prize. Fourth place went to Jeff Campf of Canby, Oregon, riding Wordworth II, owned by Kimberly Bruce. They were the quickest four-fualt trip in the first round in a time of 69.085. Rounding out the top five was Russell Morgan aboard Dusty. They came in just behind Campf in the first round in 69.158, also with four faults. 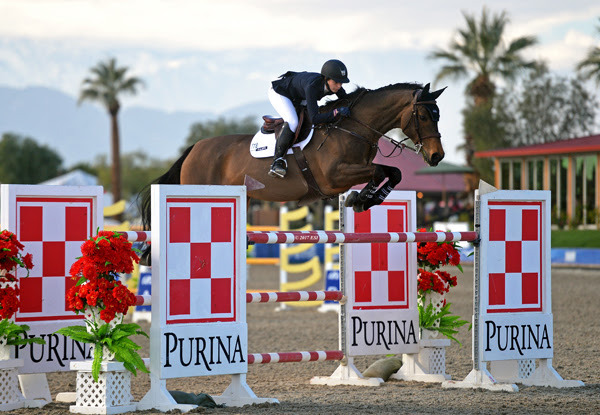 Zazou Hoffman and W Zermie 13 on their way to a $25,000 SmartPak Grand Prix win. PC: ESI Photography. 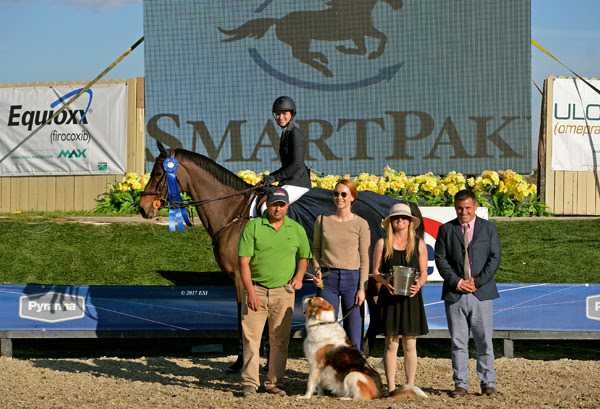 As the weekend began at HITS Desert Horse Park, riders and horses decended on the Grand Prix Ring to prove their skill and chase the win in the $25,000 SmartPak Grand Prix. This week’s winner would be Zazou Hoffman of Santa Monica, California, aboard W Zermie 13, owned by Woodacres Stables, LLC. Of the 45 exhibitors to challenge the course set by Olaf Petersen, Jr., of Germany, 10 would advance to the thrilling jump-off where it all came down to speed as the top seven all garnered clear jump-off rounds. Going seventh in the order of the jump-off, Hoffman and W Zermie 13 overpowered the trips before them with a lightning-fast round. The crowd cheered as they zoomed toward the finish to stop the clock in 35.127. Will Simpson would go home with the second-place prize aboard The Dude, owned by Nicole Walker. Simpson and The Dude have received ribbons in several featured classes through the circuit so far including first and second place in the $5,000 Johnson Horse Transportation Welcome Week II. Challenging the abbreviated course as fourth in the order, Simpson and The Dude laid down a solid round to hold up to their peers. They passed the timers in 36.070, fault-free to ultimately grab the second spot on the leaderboard. West Coast powerhouse Chris Pratt followed Hoffman in the jump-off and knew he needed to be extremely quick and efficient to overtake her round. Pratt piloted Concorde, owned by The Epic Group, LLC., to the finish, clocking in at 37.187 for the eventual third place. 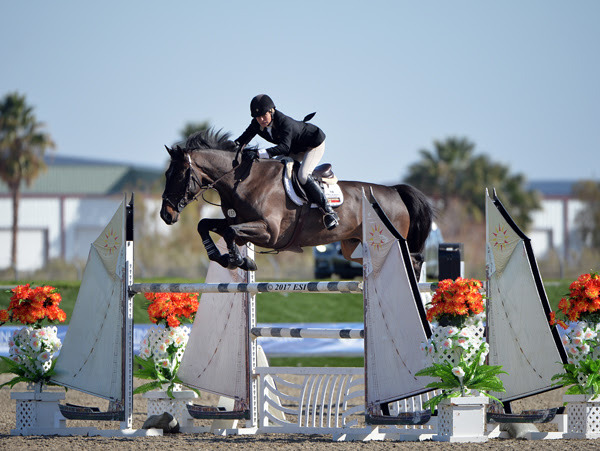 Mandy Porter of Encinitas, California, rode Milano, owned by Abigail Weese, to the fourth place prize. They were the first to go in the jump-off first and laid down a solid round to set the tone. Their time of 38.037 would hold up through several challengers for the white ribbon. Rounding out the top five was Calgary, Alberta equestrian Tammie Phillips riding Cristar, owned by Merle Gardner. They competed as the last pair of the jump-off round and clocked in at 38.906, just a tenth of a second behind Porter for fifth place.